Medicare Supplemental insurance has become a widely trending topic in recent years. It is a fact that medical expenses are continuously rising and Medicare coverage is not accommodating this. People who get insured tend to be those with a limited income or they are retirees. This leaves a huge financial gap which Medicare is not able to fill, Part B excess charges being one such example. In all, supplement insurance from Medicare is of twelve different types which cater to the different requirements of clients. These plans are designed to cover health care services that are left out by original Medicare. These plans are sold and marketed by private insurance firms, however the rules and regulations are decided by Medicare. Supplement plans from Medicare are named according to letters A through N and each plan has a different set of benefits. There are, however, certain features that are common to all the plans. Pricing, features and benefits of each plan also vary along with the company. There is an option of a high deductible offered by some companies on plans such as F, J, K and L. It is mandatory for every plan to cover certain essential features. Medicare Supplemental Plan F is an exclusive supplemental plan that tends to offer insurance coverage for Medicare Part B excess charges. These are the charges that a physician asks a patient to pay above and beyond the amount decided by Medicare for a specific procedure. Almost every doctor will accept the amount approved by Medicare for a particular Medicare plan. Nevertheless, some physicians charge more than the approved amount. An individual is accountable for paying those excess charges as and when the doctor requires. Medigap Plan F is available to the individuals who are a part of Medicare Plan B and provides insurance coverage for these excess charges. These charges can sometimes be quite large or sometimes as low as a few dollars. Medicare Supplemental Plan F saves you from all the extra out-of-pocket expenses in case you need medical treatment that surpasses what Medicare approves. If an individual buys Plan F, he or she will have to shell out a deductible of $2000 before the insurance plan pays for his or her treatment. This amount can increase on an annual basis. Did you know high-deductible insurance plans have low premiums? Since Medicare Supplement Plan F covers excess costs, one will not have to pay money for out-of-the-pocket expenses for doctor’s office care or hospital stays with this insurance plan. • The difference of the amount approved by Medicare and to what the doctor charged from you, in case the assignments are not accepted by the doctor. Supplement plan F, J and I cover the entire expenditure, while plan G cover eighty percent of the cost. • 80% of the expenditure for emergency medical treatment taken outside the country. • Up to fifty thousand dollars for the lifetime of a person. • The insured preson has shell out two hundred and fifty dollars towards annual deductible. These features are there in plan C to J. • Assistance in daily activities of living such as dressing, bathing, provided that the person is already covered under Medicare. • Assistance continue for eight weeks even after the person does not need skilled nursing. • Reimbursement of forty dollars for a visit limited up to seven visits in a week or up to an expenditure of $2,000 in a year. • Annual reimbursement of one hundred and twenty dollars for preventive care services taken from the doctor. • Annual expenditure of thirteen hundred dollars or fifty percent of the cost. This benefit is given after an annual deduction of two hundred and fifty dollars. • Annual expenditure of three thousand dollars or fifty percent of enitre expenditure after annual deductible of two hundred and fifty dollars. People who want to have the option of high deductible on their plan F Medicare insurance are supposed to pay two thousand dollars as deductibles before they get any form of reimbursement from their insurance coverage. The deductible amount is incremented every year. The insured person, however, benefits from the option of high deductibles as it cost less, but it may turn out to be a costly choice if the insured person happens to fall sick. 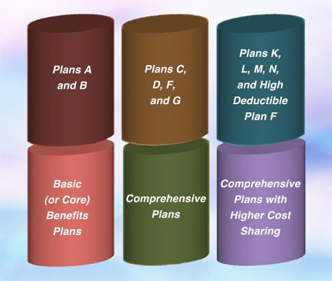 Apart from this, standard plans from Medicare supplement from to A to N and Medicare SELECT are the type of plans that cost less than standard stand alone insurance plans from Medicare. There is, however, a limitation that you can consult only those doctors that are in the network of the plan. For complete details check the insurance department of your respective state and find out what is available to you. Medicare Supplemental Plan F has identical eligibility guidelines as the other Medigap insurance plans. A lot of individuals enroll in this insurance plan at the time of the annual open enrollment period, or when their Medicare Part B starts. This time is crucial as individuals with pre-existing conditions like diabetes can also apply and are guaranteed coverage. According to the law, anyone who applies within six months of their Medicare Part B start date receives this option. Commencing on day one of their Medicare insurance coverage, Medicare Supplemental Plan F will provide 20% coverage on all the Medicare-approved charges that Medicare Part B does not pay. Not only this extra 20%, Plan F also pays deductibles for Medicare Part A as well as Part B. Even hospital co-insurance is covered. When it comes to the benefits of this plan, one must also remember that it pays for up to 100 days in a Skilled Nursing Facility. On the other hand, the original Medicare only pays for 20 days. With health care highly in demand nowadays and the economic situation in a down slope it is best that you are covered. A Medicare Supplement Plan F can help cover the majority of out-of-pocket costs in Medicare. However, this does not necessarliy mean that you need to pay too much for it. Large numbers of companies provide Medicare Supplemental Insurance, yet they all have identical coverage options. One can pay more for the same insurance coverage based on the company they choose to buy their insurance policy from. Bestmedicaresupplement agents help you substantially in determining which insurance company provides the best Medigap rates in your area. Original Medicare along with Medicare Supplemental Plan F allows people to visit any physician or hospitals which accept Medicare. In simple terms, the only thing that we pay under this insurance plan is the premium paid every month. Is a Medicare Supplement Plan F an Ideal Choice for you? In case you are turning 65 this year, Medigap Plan F is undoubtedly your best choice. Near about all insurance companies provide Medicare Supplement Plan F and the rates are generally quite good for the insurance coverage this plan provides.